Definition: The vitreous is the clear gel that fills a portion of the inside of the eye. When blood collects in the gel, this is called a vitreous hemorrhage. It impairs the passage of light to the retina and results in foggy vision. Affected individuals often notice black strings in their vision followed by a diffuse fog or haze. These symptoms often come on quite abruptly. The bleeding is usually short-lived but the blood may take anywhere from a few weeks to several years to be absorbed. Unfortunately, recurrent bleeding can occur and may result in a vitreous hemorrhage which persists indefinitely. Causes: There are a number of causes of vitreous hemorrhage. The most common is bleeding from abnormal blood vessels growing on the retina (neovascularization), as occurs with diseases such as Age-Related Macular Degeneration or Diabetic Retinopathy. When portions of the retina receive inadequate blood supply, usually as the result of diabetes or a blocked blood vessel, these areas produce a chemical which stimulates blood vessel growth. Unfortunately, the blood vessels that grow in response to this chemical are abnormal – they grow from the retina into the vitreous gel and may bleed, causing a vitreous hemorrhage. 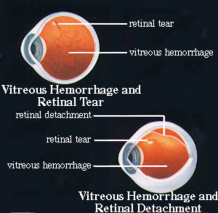 Other common causes of vitreous hemorrhage are retinal tears and trauma. The retina can also tear and hemorrhage immediately following a posterior vitreous detachment (PVD), or weeks later. If no tear has developed within eight weeks after a PVD, the retina probably will not tear. Symptoms: When there is a small bleed, red blood cells floating and moving in the vitreous create the sensation of walking through a swarm of flies. If even more bleeding occurs, it looks like a spider web or a swirling mass of black or red lines. If there is a great deal of bleeding into the vitreous cavity, vision may be reduced significantly, or even become very dark. Patients who experience sudden or new floaters, and/or flashes should call their doctor immediately. These symptoms may indicate that a retinal tear has occurred. A retinal tear may result in a retinal detachment. Since retinal tears and retinal detachments begin in the peripheral retina, your doctor may suggest that you test your peripheral vision to be sure there are no changes. Treatment: The combination of vitreous hemorrhage and retinal tear and/or detachment is difficult to treat because the hemorrhage prevents the surgeon from seeing the retina and finding the tear/detachment. In such a case, a special type of ultrasound is used to help make the diagnosis of retinal tear/detachment beneath the hemorrhage. If a retinal tear is found, this is usually treated with laser treatment or cryotherapy (freezing treatment) to reduce the risk of retinal detachment. Ultrasound is a harmless and painless test. It is like the sonar on a submarine. Sound waves are sent into the eye. They travel through the hemorrhage and bounce off of the retina. The returning sound waves make an image on a monitor and allow the doctor to see whether the retina is attached or detached. If a patient has a combined vitreous hemorrhage and retinal detachment, a vitrectomy must be performed to remove the blood so that the surgeon can see the retina. Also, a scleral buckle is often placed around the eye. Because of the combination of retinal detachment and vitreous hemorrhage, the eye is at high risk for developing proliferative vitreoretinopathy (PVR).